I tuoi dolci preferiti uniti all’aroma dei tropici! Vita Energy sempre con te. Fai scorta di Vita Energy. Non restare senza! 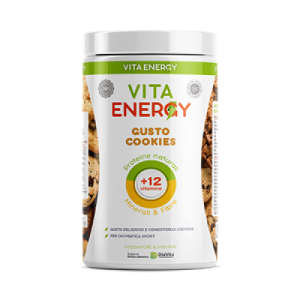 Vita Energy gusto Cioccolato + Vita Energy gusto Cookies + Vita Energy gusto Tiramisù + Vita Energy gusto Cocco + Vita Energy gusto Pina Colada + Vita Energy gusto Tropical. Сhocolate flavoured premium smart shake mix contains 74% natural protein for a healthy and balanced life. 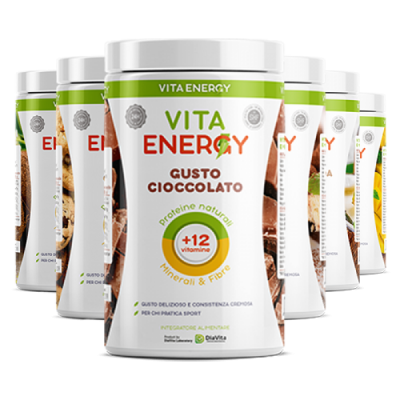 Vita Energy Chocolate makes a healthy lifestyle taste delicious! Decadent and delicious, it’s hard to imagine a healthy protein shake could taste this good. You will fall in love with Vita Energy Chocolate from the very first sip. Nothing beats this creamy, chocolaty, delicious goodness! Vita Energy Shake is a carefully balanced All-in-One beverage suitable for anyone at any time. The nutrient-packed smart Vita Energy cocktail gives you the maximum benefits a high quality shake can offer, allowing you to achieve your wellness goals with ease***! Enjoy the aroma of homemade freshly baked cakes – what could be better than that! Just feel the atmosphere of home-made sweets without having to make something yourself. This is doubly more pleasant along the high-quality protein Vita Energy shake. Want a legendary Italian dessert in just a few steps? Feel the famous Dolce Vita atmosphere with the Vita Energy Tiramisu Shake. You will feel true satisfaction from its delicate taste and captivating aroma combined with the health benefits of a high-quality protein shake. 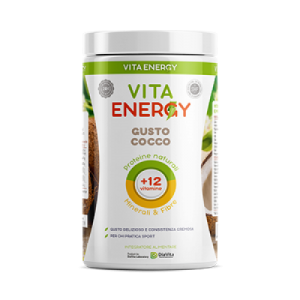 If you like tropical fruit, Vita Energy Coconut is a must-try! Savor a fantastic tropical sunrise or pre-workout drink that is delicious and very easy to make. This creamy, filling drink’s flavor is full of high quality proteins and coconut flavors. If you like Coconut and healthy lifestyle, you will love this. 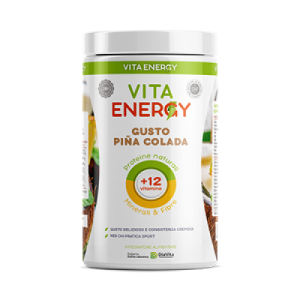 If you “like piña coladas…”, Vita Energy Pina Colada is a must try! Gift yourself a fantastic tropical morning or pre-workout drink that is delicious extremely easy to make. This creamy, filling drink’s flavor is full of pineapple, bananas, coconut, and vanilla flavors. If you enjoy Pina Coladas and healthy lifestyle, you will love this. Perhaps the easiest and most delicious way to the tropical paradise is to taste Vita Energy Tropical Shake. These tropical-flavored shake will bring some fruity goodness into your high-protein meal plan. Blend one up and pretend you are laying on a beach somewhere warm.